Warning: The sentimental ramblings of a sleep deprived mother lie ahead. (I’m not joking, sleep deprivation is not pretty. I cried about eggs this morning) The knitting content follows. Scroll down if you hate this stuff. Yesterday, my charming and accomplished daughter Amanda celebrated her 15th birthday. She had cake, and presents and the adoring throngs. Or I think she did, I was at a birth. 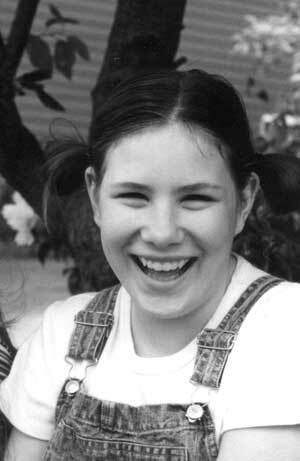 I am beside myself about missing her birthday, but if it is any consolation to her…I thought about her all day. As my client M. became a mother, I remembered becoming a mother myself. I remember being so tired, and so happy…and so completely freaking terrified that it’s a wonder I was capable of being anything at all. My client had a baby boy, and I told her about nursing, diapers, crying (hers and his) and swaddling. When M. had a little cry over it all, I almost told her this is only the beginning, she is going to cry about colic, and diaper rash and first smiles and big messes. That she will dissolve over laundry, and dinner and why toddlers only eat yellow beans and toast fingers for weeks at at time. She will weep for lost teeth, the first day of school, chicken pox and that kid who isn’t nice. There will be rivers wept for walking alone to school, getting phone calls from boys, failing math and the first time this kid says “No thanks Mom, I don’t need any help”. I told M. that now she was a mother. That now things would be different. 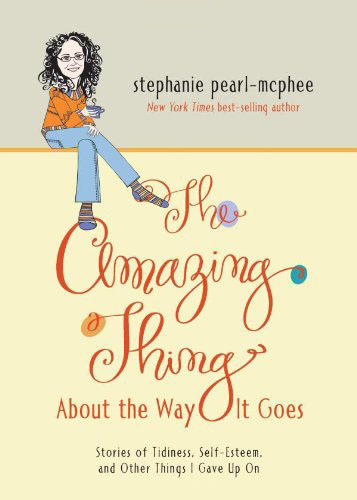 That now…now everything she ever thought she cared about, her job, her garden, her knitting? All that is nothing. That the whole world just shrunk down to the size of about seven pounds, fifteen ounces. That this is going to be so hard. That Motherhood is the end of quitting when it isn’t fun. That there are no words for how much you will love this person. When last we saw our adventurous Harlot, she was boarding the subway to journey downtown and meet Laurie (of the comments) who was visiting from Maine. I adore her. We had an awesome lunch and embarked on a yarn crawl. There was much shopping, and talking and the exchange of gifts. (I totally scored here…I’m not even going to show you everything that Laurie gave me. I’m afraid that the envy would corrupt you all if I don’t pace it.) 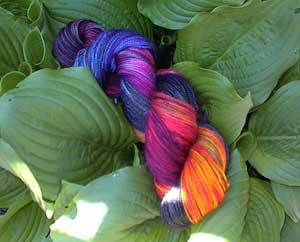 For today we will only admire the extremely cool sock yarn that Laurie dyes and spins. 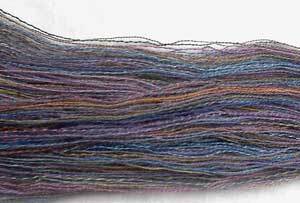 Pretty yarn…yes? HA! You like it already and you don’t even know what it does. Note: I am not at all ashamed to admit that I got home from meeting Laurie and within about..say, 9 seconds, had cast on this sock. Tank? Dublin Bay socks? What was that? Cast aside like rags, and you know what? Didn’t even flinch. Not a second thought, not a moment of regret. I don’t even hear their little woolly voices calling out to me. (You can’t see me…but I am dancing. I am wearing a ratty orange tee-shirt, plaid pants and that sock) I love it. Love, love, love. 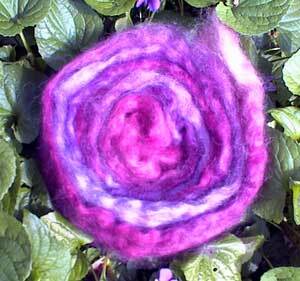 Laurie dyes the the roving, then spins it up, (Her spinning is perfection by the way. So perfect that if you hadn’t had lunch with her and found out that she is so nice that you couldn’t hate her for it, you probably would) then she navajo plies it so that she can have a three ply without disturbing the colours. Laurie explained all of this to me, and as a spinner I understand what she’s telling me, I mean, I speak English…I heard the words, I understand the concepts individually but somehow, doesn’t this yarn seem like only a very cool magic trick could conjure it up? There are so many variables that I just don’t get. How much roving? When to change colours? I’d think that Laurie just got lucky but she was wearing a pair in another colourway, so she’s pulled this off at least twice. With my wool as my witness, I will learn how to make this. It’s cold and rainy here again, and I’m starting to feel like some kind of an idiot for knitting all these tank tops. Really, if you figure it from May 24th and count until school goes back at Labour day, we here in Toronto really only have about 16 weekends to sit on a patio having a pint with our knitting. (Ok, so I’ve only ever seen me or Ken sitting on a patio knitting in the sunshine with a pint, but we’re trend setters) Things are not looking good. Given the forecast, there are only 14 chances left. Is Toronto being punished for something? Have we somehow angered the planet? What happened to Global Warming? (Am I the only one who has thought that they were going to have a hard time convincing Canadians that global warming is a bad thing?) I’m going to go buy something aerosol. I swear it. Global warming my arse. The pointless tank knitting continues apace. The back of the Freudian slip tank being mere rows from completion. 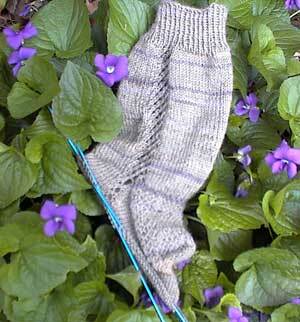 and I finished the first bastardized Dublin Bay sock. What do you think Ryan? Now I’m off, heading downtown to meet Laurie of the comments, who is visiting Toronto. We are going to lunch, then a little bit of a yarn shop crawl, going definitely to the wonder that is Romni wool, and possibly to the charm that is Lettuce Knit, in the market. I’m going to go now and get Laurie’s present ready. See? Presents. A 6000 square foot yarn store, lunch and presents. Why wouldn’t you come? My mail is giving me whiplash. The letter carrier has been to my door several times in the last few days, and what he brings is swinging wildly from soul crushing and frightening work contracts, and fabulous presents from afar! Then, this morning a very scary work thing came and while I was sitting there, holding the papers, thinking “Here’s another nice mess you’ve gotten us into“, and wondering, really…how many hours do I think there are in a day? When the postman came and gave me THIS. All hail the goddess Beth. Seriously, look at this stuff. I wish you could feel it, it is moments like this where the internet is woefully inadequate. 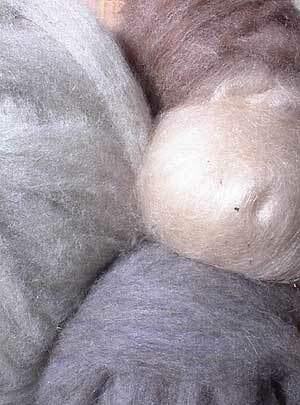 There is Honey Mohair (the honey coloured one), a wool/silk/angora blend (grey//blue bottom right) Something very soft and brown/camel coloured (Hey Beth? What is that?) and the pièce de résistance a very soft, very beautiful pale grey that comes (I think) from Beth’s own sheep, fine white blended with grey and alpaca. The sheep have names like Autumn, Grace, Faith and Onyx, and they make me want to trash my stupid urban life and go…have sheep and do….well I don’t know what Beth does with her time, but the way I see it, if you get wool like this at the end of it, I’m in. I am temporarily “making do” with espresso, but since it only took me 37 seconds to type this entry I may be hitting overload with that strategy. I understand if you need a moment. It’s a profound thing of beauty, and at the risk of incurring some sort of spinning based revenge from the planet, I have to say that the spinning is pretty darned good. Overall, I think this may be 180 metres of the nicest yarn I’ve ever made. (By “nicest” I mean that I expect that this yarn will, by simply existing in the universe, lead us all a little closer to wiping out crime and leading lives of quiet fulfillment and simple joy.) A closer look? Moving, isn’t it? The urge to drape the skein around my neck and go waltzing around the kitchen while blasting The Brandenburg Concertos and weeping for the beauty of it all is almost more than I can resist. 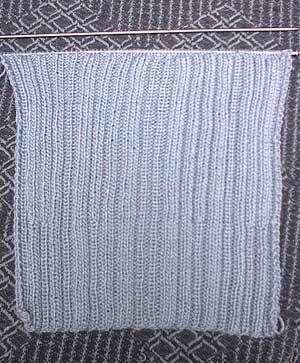 I when that was done, I grounded myself by knitting the amhole armseye armscye of the Freudian slip. 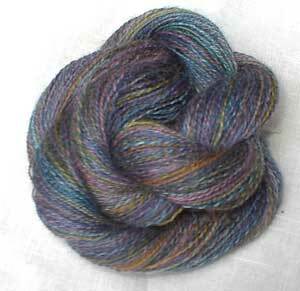 I know that this pales in comparison to the excitement of the very beautiful laceweight, but what can I say. The universe seeks balance. When my alarm goes off, I go and try to wake the girls. I start with nice mommy talk. “Good morning little dollies, rise and shine, mornings are nicer if you don’t have to rush” and work my way though the full line of interventions until I’m yanking the blankets off of them and whipping their clothes for the day around like I’ve lost my mind. (Which, I suppose I have) For their part, they run the gamut of potential responses in a traditional order. Play dead – ignore – moan – cry – claim illness – claim exhaustion – refuse – get up -be foul tempered to the crazy lady whipping your clothes around. This is every school day morning. Yesterday morning I inexplicably woke at 6:30. It took me a moment to work out what I was hearing. All three of the ladies up, making breakfast, brushing teeth and speaking to each other in lovely voices. Stuff like “Samantha, I found your spelling book for you, shall I put it in your backpack?” and the unbelievable reply “Yes please…your waffles are ready”. It was like waking up in a Surrealist painting. Was I dreaming? Was this real? Had I finally slipped away in my sleep, killed by housework and unmanageable deadlines? No, no…it was real, the mountain of laundry a sherpa would find daunting still stood by the door. Turns out the girls have decided that it would be a nice change to start their days early so that there is no rushing. they plan to get up even earlier tomorrow. I am speechless. It is a testimony to parenting. See that? All these years of saying that and it finally sunk in. I feel overwhelmed. You know, you dream and you dream…you hope that your children are going to learn what you are trying to teach them and then one day, it all comes together. I feel badly for all you mothers out there who haven’t had it happen for them. Then this morning at 5:13 I wake up because all three of their alarm clocks are blasting and they are all sleeping like the dead. I go round and shut them off, and return to bed. Joe (appropriately) quizzes me on “what the (*&^%$!!! ” is going on. Human frailty Joe. Human frailty. This morning, as I staggered out of bed, some things occurred to me. This by itself was rather remarkable, since I am generally incapable of thought until I’ve had a fair bit of coffee. More things have occurred to me since getting my coffee…so let’s get a little introspective, shall we? 1. Claudia threw down the gauntlet yesterday in the comments, surmising that her lime tank is better than my blue tank. As I prepared to go to war to defend my blueness and say vile and defiling things about Claudia’s lime tank, and go make a comment on her blog about how sucky the lime is anyway, and why doesn’t she….like…knit blue stuff when it hit me. I like lime better than blue. (I am especially envious of Claudia’s lime, which is much better than my blue) I like orange better than blue too. I also like green better than blue. This revelation begs the question “Why is everything I’m knitting for myself blue?” Pathetic Fallacy perhaps? Does this mean that I’m expressing something? Is the blue symbolic in some way? Do I own too many pairs of jeans? Am I wimping out? 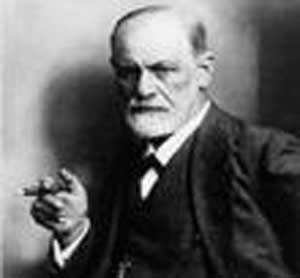 What would Freud say? I can’t wait to get to the front, at least then the cables will prop up my will to live. This brings us to the second question. Anybody else notice that I’m knitting pretty simple stuff these days? Is it just me? I feel like my knitting lacks…zip or something. 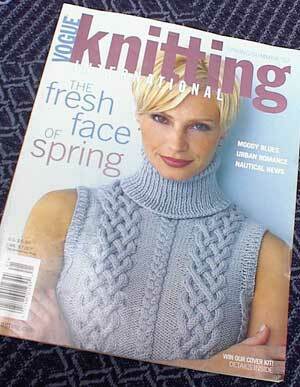 What I need is Daredevil knitting. Something wild and dangerous, something with real hazard, like huge gaping steeks, or reams of lace knit from the finest wool I can find…or maybe a sweater with an insane chart, screw that, how about like Four charts, yeah! Four charts with tiny little squares and parts where the instructions are vague and it’s do or die baby. Some pattern that takes real gumption, something I can get behind. A pattern that takes guts. It may be (gak) time for another Starmore, or something like THIS. (I got woozy when I looked at that. I’ve wanted it for so long). 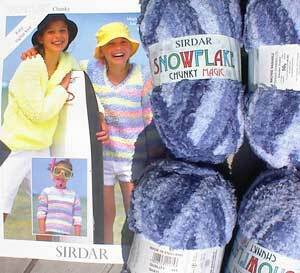 Suggestions for breaking out of my knitting blue funk are graciously accepted. Samina asks which mag my new cabled tank is in, why it’s Vogue Knitting spring/summer ’02, (you know, the one with the blue sweater on the front.) but do me a favour, knit it out of something orange, will ya? This weekend marks the traditional beginning of the Canadian summer. Victoria Day is the traditional open your cottage, bbq in the backyard and drink beer in the garden weekend. It is also Toronto’s safe planting date, the risk of frost is past. (This celebratory weekend was of course the planets opportunity to have a good laugh by besetting us with rain of biblical proportions and coming as close as possible to frost without actually having a frost.) Despite the nasty weather today is a National Holiday, and we are celebrating with a new tank top. What you can see in this picture is that it’s just about exactly what I wanted. The armholes armseye armscye armholes are perfection, and the decolletage is good. My bra straps don’t show (as an aside, I want you all to know that I went on a special hunt for it, just for this picture) and it fits really nicely. The only thing that I wish I had done differently was to put a little more shaping in the waist. I don’t know why I persist in thinking I’m shaped like a tree trunk. Admittedly, my 30-something, post-3-baby body isn’t what it used to be, but I could take a waist measurement instead of somehow assuming that I go straight from hip to bust. 1. Miami is not the flattest of ribbons. This slight roundishness may improve stitch evenness. 2. 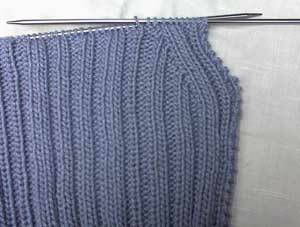 I am knitting at a slightly tighter gauge than suggested. This firm fabric leaves stitches less room to screw around. 3. These are pretty crappy pictures. The stitches are just as twisty and annoying as any other ribbon. 4. I am a knitting goddess. 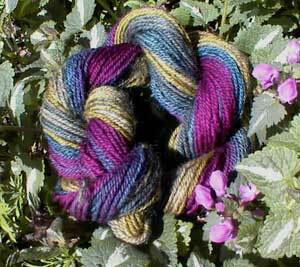 I have magic powers of non-twistyness over ribbon yarn and never suffer as other knitters do. Despite having a bizarre amount of work to do (really…like 50 hour weeks) plus the kids and the house (and my blog mistress) as well as having promised two sweaters for gifts, I somehow decided that what I should really do with my evening last night was start a new tank. This yarn (cotton twist) is driving me nuts. It’s a pretty thing, but it’s beauty may not be enough to convince me to look the other way about it’s evil splitting ways. This yarn and I may be splitsville. This was motivating. How hard are you going to work to make a mundane, pedestrian armhole? Now an armseye, that’s an accomplishment. How sophisticated, how chic, how clever is a woman who knits an armseye? I followed the smart and funny directions given to me by Vicki (go read ’em if you didn’t, the woman knows her way around an armhole armseye), combined it with Rana and Anne’s suggestions to use a garment that I like already and came up with this. Finally, Kathy mentions that the dairy Queen here in Ontario sells Poutine. Diana asks “What’s Poutine?” Poutine (peau-tin) is a Quebecois heart-stopping culinary masterpiece. French fries topped with fresh cheddar cheese curds and gravy. If is a little known fact that if you pay very close attention while you are eating it, you can actually feel your heart slow down. Poutine has spread far from Quebec and can now be purchased not just in Dairy Queen but McDonalds, Burger King, and Harveys and can be found from Vancouver to Nunavut to St. Johns. Poutine has (on average) 60 g of fat and 700 calories. It is a National Identity food for Canadians. This is a classic Stephaniesque moment. I’ve reached the armhole of the tank, and as I was about to begin it, I realized that I have no idea what I’m doing. None. 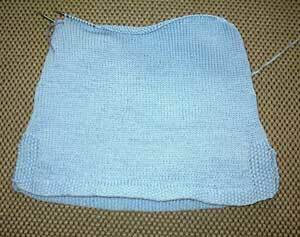 I thought that I would simply cast off the right number of stitches in the correct place then decrease in an appropriate curve until the armhole was deep enough and wide enough. Good plan eh? What was I thinking? The “right” number? The “correct” place? What did I think? That this mystic information would come to me in a dream? That upon reaching the armhole I would be suddenly filled with the cosmic armhole knowledge that I lack? I have sat very quietly with the tank in my hands for some time, but the answer hasn’t come to me. This can’t be how design works. I bet this never happens to Bonne Marie, I bet she was born knowing. I bet that when she gets to an armhole it all just feels right. The options as I see them are as follows. 1. Just try it. 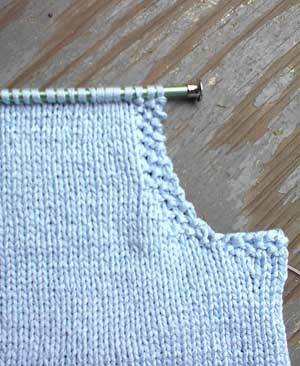 (I don’t know what “it” is, but maybe the vague armhole voodoo will spring fully formed into my mind as I knit.) This plan also involves me reaching deeply within myself for the acceptance that this will include a lot of frogging. 4. 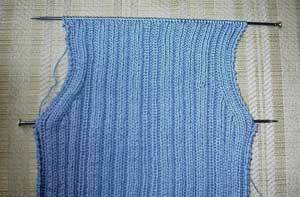 Appeal to the knitters who read this blog to impart the principles of armhole enlightenment. Yesterday, after publicly humiliating myself on this blog, I walked the green (doesn’t “green” seem like to mild a word?) sweater to the donation box, got myself on the bus and went downtown to meet Kathy (of the comments) and her friend Nadine while they were in town for a visit to Koigu. I didn’t tell you all ahead of time because I figured that if we hated each other, we could just forget that it had ever happened and nobody would ever have to know. Turns out, Kathy and Nadine are a whole lot of fun. Clever, nice, funny…these ladies had it going on. We lunched downtown, then jumped in a cab and went to Romni. Romni is a huge wool store and they have tons of stuff. (Really, tons. I mean if you aren’t prepared for it you can be a little overwhelmed. Me, I have a high resistance to wool, so I do ok…but some new knitters might get a little woozy. Just put your head between your knees and don’t look at the cashmere and you’ll be ok) We made a beeline for the Fleece Artist stuff, and in the interest of leaving you with the impression that Kathy and Nadine are women of restraint and decorum, we shall not discuss any further details of that trip. Suffice it to say that they have excellent taste, lovely manners, wickedly sharp senses of humour and I’d spend time with them any way I could get it. (They went to Koigu today and they said I could go with them but I have a stupid *job*. I cannot tell you of the deep and bitter pain that I feel when I think of them being there without me. I may have bought a little fibre at Romni, but stuck exclusively to the Canadian wools theme that Kathy had going on and just got me a little fleece artist. This is their sock yarn. 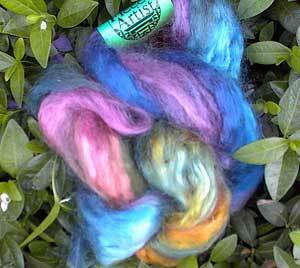 Hand dyed merino. I have no idea why my camera is refusing to recognize the actual colours present in this yarn, but for starters, the actual orange in the yarn is a lovely burnt orange sort of colour, with olive undertones. Not Day-glo/tang/preventing hunting accidents in the woods/ orange. 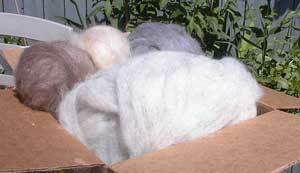 This is kid mohair roving. Be still my heart. I tried really, really hard to demonstrate some sort of fidelity to the socks, or the tank, or the cardie (oh…yeah. I started another cardie. 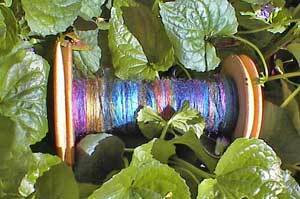 It’s boring, you don’t care) but I sort of accidentally spun up some of the roving. I love every single inch of it all. Do you know that for weeks now, I’ve been traipsing out to my front garden each morning with an armload of knitting, fibre and yarn, then carefully positioning it all in amongst my plants, crawling around in the garden for good vantage points, and taking pictures of it, and not one of my neighbours (I’m in the garden right against the sidewalk. People are literally passing within inches of me and my sweaters in the bushes…inches. I live in a busy urban neighbourhood too, lots of people passing by.) not one person has asked me what the hell I’m doing? Just thought I’d mention that. Before I show you anything today, I feel like I should direct a personal note of explanation to Ryan. 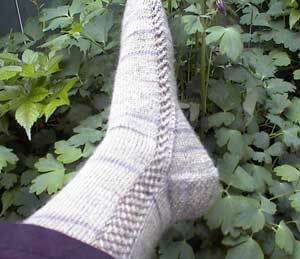 Ryan, I want you to know that I’m very much enjoying your Dublin Bay sock pattern. I really love it. It is perfection in and of itself. I have no idea then, why I was compelled to bastardize, modify, personalize the design a little. I have a disease. I am incapable of knitting a pattern all the way through without changing something. Even if, and I stress this, even if there is absolutely nothing lacking in the pattern. I have modified the likes of Alice Starmore (who’s sweaters tend to be a little wide…no offence intended) and The Dale of Norway Team (who had me confused with some knitter who does duplicate stitch). I am an equal opportunity despoiler and I am sorry. I would tell you that I’ll try to stop, but I’d be lying. Let’s not have that between us. 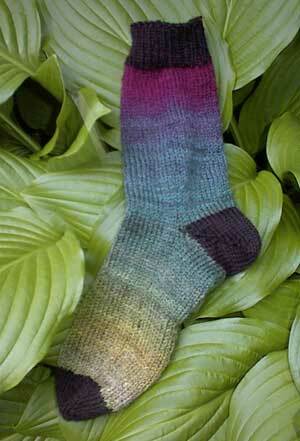 Now, on to todays picture of the corrupted sock. As you can (probably not) see, I have decided that the pattern should continue down either side of the foot from the leg pattern. Since I’ve accepted that I was out of my mind when I planned these for my brother and have consequently adapted my recipient plan, I see no reason to minimize what I can now freely refer to as “lace” rather than the more masculine “openwork”. I like the continuity of keeping the pattern going down the foot, not that (and again I stress this) not that the pattern was not indefectible, masterful and sublime before I ruined it. 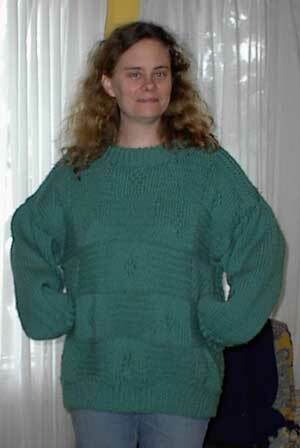 Without further ado I give you the Michelin sweater. Is this not the most attractive sweater in the world? Finally, I have not been cowardly and cut off my head in the photo, but I do want you to know that this picture was taken early, and by a child, and I had not done any er…”improvements”. (Like, say…brushing my hair, drinking coffee or putting on a smidge of lipstick). I am, in reality far more attractive than I appear here, and way taller and thinner than I look. Also, in my real life I am not wearing that sweater. That should help.